This painting, by Nicolas-Antoine Taunay, is one of very few which depict French Revolutionary combattants sympathetically without any overt ideological message. It is included in the Bridgeman Art Library, so it is reproduced many times on the internet but there does not seem to be much information available about it. The original is from the Musée des beaux-arts in Orléans, but it was acquired only in 1975. The title is usually given as Bivouac of the sans-culottes, but this may not be original - the date of 1790 seems a little early for sans-culottes. On the other hand, to judge from their pikes and civilian clothing, this is clearly a group of Revolutionaries. The scene conveys a sense of their quiet comradeship and weary determination - I particularly like the man on the right puffing tranquilly on his clay pipe. Taunay was a well-regarded landscape and genre artist, who studied initially with the history painter Nicolas-Guy Brenet and later with Francesco Casanova. 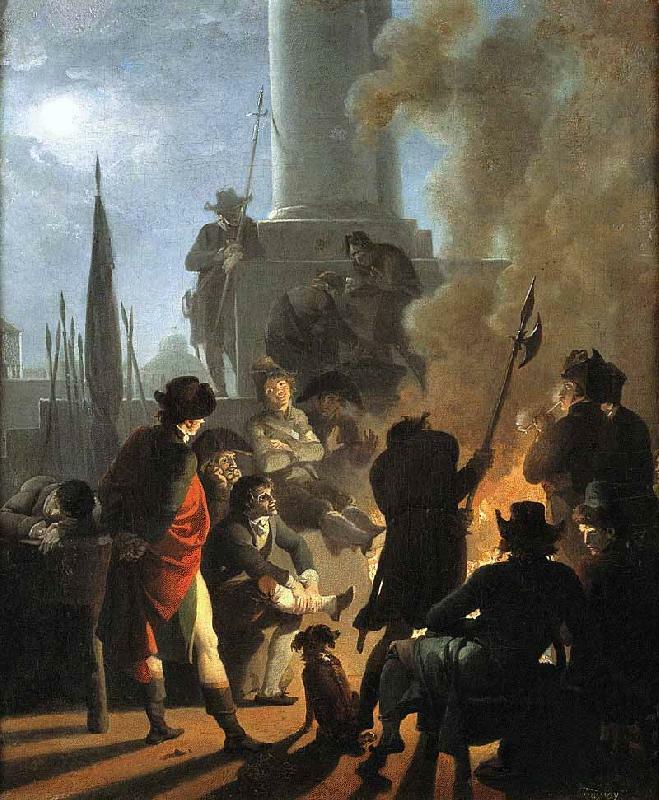 There is only one other Revolutionary scene by him known, a Fête de la Liberté, now in a private collection in São Paulo. It appears that during the Revolutionary years he continued to submit to the annual Salons mainly traditional historical and Biblical subjects, as well as landscapes of the Italian countryside. In July 1792 he exhibited "The taking of a town" ("La prise d'une ville") which was bought "for the nation" and in 1798 "The exterior of a provisional military hospital", now in the Louvre. He is known to have taken refuge with his family in Montmorency during the Terror and perhaps showed his disillusionment in the large canvas "The Guillotine in Hell" in the Hermitage, which is ascribed to him on stylistic grounds. Under Napoleon he enjoyed the patronage of the Empress Josephine and received numerous commissions for battle paintings, many of which are now in the collections at Versailles. In 1816, following the defeat of Napoleon, he journeyed to Brazil where he was invited to participate in the newly formed Academy of Fine Arts in Rio de Janeiro. He returned to Paris in 1821 and died there in 1830. There is a full scale study, Nicolas-Antoine Taunay (1755-1830) by Claudine Lebrun (ARTHENA, 2003). However, from what little I can make out from Google "snippet view", this does not have anything new on Le Bivouac des sans-culottes.